All of these things and the plethora of other decorations I have are stored in trunks under my bed, which is raised quite high to accommodate everything as we take space where we can get it in a NYC apartment. After wrestling with "to decorate or not to decorate" again this year, I pulled out the trunk containing the stockings and dolls to just see if I could get inspired. The stockings were right on top and as I pulled them out I didn't feel much of anything which shook me quite a bit as they have a lot of sentimental value for me. So, I set those aside and thought, "Nope it's not gonna happen again this year, I will not be decorating." Instead I decided that since everything had been packed away for two years I would do an inspection, see if anything needed repairs or cleaning and just make sure all was packed properly. I would clean and organize this year for the holiday . . . or so I thought. Going back to the trunk, a small mouse figure in a Santa suit holding a gift was next on top. I picked it up and got a little chuckle looking at it. As I began to fuss with it, checking its clothes and fluffing its hair I heard myself say out loud, "If I were to decorate this year, where would you like to be?" Completely surprising to me, I got an answer - more of a feeling in my stomach than words in my head, but a clear indication of where it wanted to sit. There I placed it. I went back to the trunk and continued that process of inspection, fluffing, and repair (if needed), asking the doll where it would like to be, sometimes walking around my apartment showing available spots. After about an hour the trunk was empty and everything was placed in its chosen spot. Interestingly, about 90% of the time I would not have put them where they wanted to be; for example, some dolls that I used to keep in pairs were now placed by themselves. A velvet stocking with a rabbit inside that I've had since my childhood was the most adamant about where it wanted to be placed. I always hung it in my bedroom which is where my mom placed it when I was young. So to me it always belonged in a bedroom. Not this year – it wanted to be front and center in the living room, hanging right next to where I would normally put the Christmas tree, which I still wasn't sure if I'd do this year - more to come about that. During this process, I could hear my mother's voice as I fluffed and posed the figures. I liked to make their hair stick out in all directions and have fun with them and mom's voice would laughingly say, "Darren, what are you doing? Make it nice." I giggled and laughed my way through happy tears as I placed everything. Now about that tree. The idea of getting a tree began again to feel overwhelming and daunting. A friend offered to go with me to get one if I would help him get his. We got his first but after that I said I wasn’t ready for mine yet. That weekend I took a bath and while in the tub this "story" of the Unwanted Christmas Tree formed in my head. I normally place the tree against one side of the French doors between two rooms. After removing one of the doors and cutting branches from one area of the tree, I can push it back into the door frame. This position allows me to see it from nearly every room in my apartment. This unwanted tree of my "story" had a side where it was missing quite a few branches and even though some thought they could hide it in a corner, this tree still showed too much emptiness that way. But for my needs it would be perfect. A couple days later my friend ventured with me to one of the Christmas Tree sellers so ubiquitous on the streets of NYC during the holiday and guess what I found, a tree missing about a foot and a half of branches on one side. No one would be taking this tree, but it was ideal for me. So, I brought Herbert (yes, I named the tree) home and placed him in his spot. And there he sat for a week and a half, unlit and undecorated. It was actually quite nice having a bare Christmas tree for a while. I could appreciate it in it's "pure" form. But then the stockpile of ornaments and lights under my bed began to get restless. Still, I didn't want to just decorate it without thought or meaning. A conversation with a friend about the symbols of this time of year, specifically about the Winter Solstice and the idea of the returning light gave me an idea. I would light Herbert for the solstice. I invited a couple friends over to help me and to participate in a ritual about the return of the light. I wrapped Herbert in lights and put everything on a dimmer. When all was ready, I turned him "off", closed the blinds and curtains to block any ambient light from outside, lit a candle and spoke some words about the meaning of the solstice and going into the darkness and emerging once again into the light. I blew out the candle bringing us into complete darkness, struck my crystal singing bowl, and we followed the sound as long as we could, then sitting in the silence and darkness for a while. 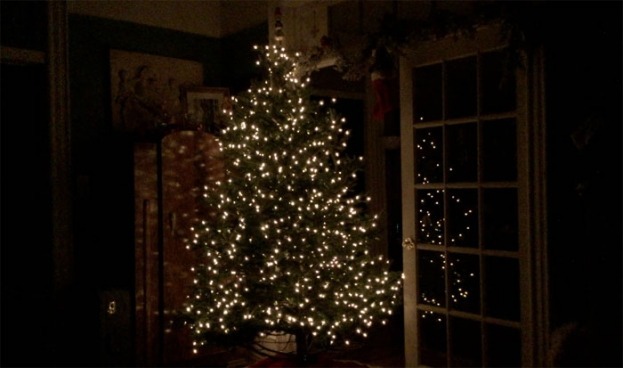 Finally, I very slowly began to bring up the lights of the tree to full power. It was utterly magical – and exactly what I needed to mark the season. It still took me several days to get around to putting ornaments on Herbert. But I realized I could follow the process I had with the other decorations and "listen in" to see where each one wanted to be hung on the tree. I've been collecting these ornaments for decades and many are treasured gifts from friends so I wanted to show them the same respect and reverence they deserved. Soon, Herbert was decorated and glowing with color and whimsy. I hope to carry on these rituals and make them a tradition in the coming years – lighting my tree for the solstice and asking decorations where they'd like to be. It's not about worshipping material things but respect and reverence, honoring the spirit of them, the spirit in which they were given and are cherished. And allowing myself to fully feel the broad range of my emotions during this beautifully challenging time of year. A neighbor came by recently and the first words out of his mouth upon entering my apartment were "Oh my gosh Darren, it's so beautiful and cozy." That for me is the meaning of Christmas, to create a magical space of wonder and awe to share with those near and dear to me, a cozy space to be in communion with friends and family. One final curious occurrence. My two current cats, Link and Chandon, have never bothered with any of the Christmas trees I've brought home. They sniff them a bit at first but then the rest of the time they just kind of ignore them for which I'm extremely grateful for any attempts to climb them or bat at the ornaments could only end in disaster. But this year Chadnon decided she wanted to be part of the picture, so to speak. Coincidence? Maybe, but I'd like to think she too "got in the spirit" this year. Abundant blessings to you and yours for the New Year.